February 7 marks the 11th time in the 21-year history of the annual RCB Tennis Championships of Dallas that a special day of this men’s event dedicates proceeds to Susan G. Komen. This multi-day $125,000 championship brings together top athletes on the pro tour for an intimate indoor event. The event features fabulous tennis, great food and spirits, shopping galore and having an all-around good time. 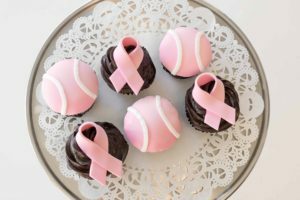 Although a men’s tennis tournament seems like an unlikely fundraiser for breast cancer, some friends who were breast cancer survivors and had connections to both the tournament and Komen came up with the idea to make it happen. “This is one of the most rewarding events T-M does all year,” Pink Day co-chair Lori Plum said. She is joined by co-chairs Mary Evelyn Raedisch and Jan Osborn. Becky Nelson (in apron), is a T-M member and daughter of a breast cancer survivor. 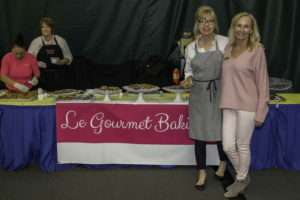 Le Gourmet Baking (LGB) will donate the buffet lunch on Pink Day for the second year. Becky Nelson, owner of LGB, T Bar M Racquet Club (T-M) member in her tennis playing days and daughter of a breast cancer survivor, sees this as an opportunity to give back to a cause she is closely connected to. In addition to lunch, Le Gourmet Baking provides their popular pink tennis ball shortbread as a take away. “A new touch of pink will be added to the dessert menu … strawberry cake!” according to Nelson. “We are honored to be Pink Day sponsors along with Title Sponsor RCB Management. Open to the public, Pink Day features tennis beginning at 9:30 a.m., with Le Gourmet’s lunch served at 11 a.m. Tickets are $40 each ($35 for group of six or more) and can be purchased from Lori Plum at lplum@tbarmtennis.com or by calling 972-233-4444.